What TSV training options are available ? Club Teams, Texas Synergy Training Academy ,Summer Camps, Summer Sand Training, and Summer/Fall/Spring Clinics. Click on a training above for more info! Club volleyball gives players an opportunity to play volleyball almost year around. It keeps them competitive during school off season and offers different levels of play to match commitment level. Club Volleyball has been known to help school volleyball programs grown and reach state titles! Playing in Jr. USA volleyball gives players the chance to play all over the country on a National Level. Players who love this game and want to play in college often play for national teams. Players looking to make their school teams or maybe varisty their freshman or sophomore year often play on regional teams. Either way their is a club and team for every commitment level and goal. Joining will give your daughter the opportunity to have fun doing what she enjoys while being trained by experienced and dedicated coaches in a positive environment. What is the difference between Texas Synergy and other area volleyball programs? A few things set us apart from the rest. We are a new, growing club and were created to provide athletes and families with quality and value in their club volleyball experience. We have a private training facility. This allows us to offer more training as we don't have to go through scheduling with the city. Our focus on our players and helping them grow and reach their potential, while creating a fun positive, team/club synergy gives our members all the positive aspects of participating in club volleyball. Being a smaller club provides for an intimate, family like environment for our members. And allows for more attention and long term investment in your child's club career at every level! We assure all teams will achieve tournament success by everyone involved adhering to Texas Synergy's philosophy and staying committed to the process and the team. How many teams will TSV form for the 2019-2020 season? We are looking to form 11 teams for the 2019-2020 club season. Texas Synergy WILL NOT form teams for "good numbers" or the sake of having more teams. We believe in the integrity of our club and forming quality competitive teams. As our staff continues to grow, we hope to add more teams in the future allowing all players who wish to play the opportunity.Click here for team descriptions/levels. Why are there multiple levels of teams(NATIONAL/REGIONAL/LOCAL)? Each level has different criteria in commitment level, training schedule, cost, and traveling. This give players and families the opportunity to try out for the team level they are comfortable committing 110% to. All teams formed will have athletes as close or equal in skill level as possible. We believe our athletes need to be challenged and pushed in practices and training. To do so constructively, we have set standards for each team level. If chosen, your athlete will be placed on the team we feel will fit their current skill level, and potential for the season; insuring they will see growth while building self esteem and having a successful season. Teams will not form with less than 8 players. Max of 12 for 12 and under Max of 11 for 13-14s and Max of 10 for 15-18s. Is playing time equal? How is playing time decided? Texas Synergy Volleyball DOES NOT guarantee equal playing time! All playing time is earned at practice and in past tournament game play and soley at the Master or Head Coaches discretion! Equal playing time should not be expected in any competitive environment. However, we believe having well matched teams will alleviate most playing time issues. Our staff is trained to work with line ups, rotations, and sub patterns to maximize use of their roster. Putting players in positions to be able to positively contribute in game/tournament play. A list of player expectations will be given after try outs. What to expect at try outs? Check in for Try Outs begins 30 min prior to start time. The doors will not be opened until 15 min before try out start time. 1) Players will check in at the front desk and receive a tryout number with t shirt. Parents may stay for the duration of the tryout or may leave, but there must me a legal guardian present at the end of the tryout. 2) Players will go through a series of fitness and basic skill assessments and consist of drills and game like situations. Players will be evaluated on skill level, potential, attitude, and interaction with other players and staff. 3) We will either post teams or hand out envelopes with our TSV OFFER. 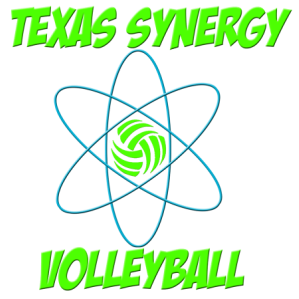 4) Should your athlete be chosen for a Texas Synergy team, a non-refundable deposit will be due at the Club/Team meeting following the tryout. This deposit secures a position on the team and is the initial payment of your season fees. If you do not leave a deposit your position on the team is not secure, and the spot may be filled. You will also be signing a parent/player agreement committing to Texas Synergy Volleyball Club and usav forms at this meeting. We will discuss team/season information and future team meeting dates. 5) Players who make Alternate or practice team will need to fill out a form stating you want to be on the alternate list and contacted first if and when a position becomes available. What are the fees for Alternates or Members of the practice team? The fee for members of the practice team is $900. If we are able to form another team, or a position becomes available these players will be our first option! When will team practice/tournament schedules be finalized? Club practice schedules will be finalized and posted October 15th. National teams practice 3x per week, and Regional and Local teams practice 2x per week. Weekly positional for National and monthly positional training for regional and local. Teams can expect official practice/tournament schedules to be posted in October. Tournament schedules are not released by the region until October. CLICK HERE for more info provided by the Lone Star Region and USAV on the Junior National Championships. If a Texas Synergy Club team qualifies for Nationals an additional payment will be due by June 15th to extend the season an additional 2 months. All team/club travel will be scheduled and posted by November 2019. This will include hotels and car pool information. PLAYERS ROOMS ARE NOT INCLUDED IN TEAM FEES, AND WILL NOT HAVE TEAM ROOMS! We will block off rooms for parents at time of booking. PLAYERS ARE REQUIRED TO STAY AT OUR TEAM HOTEL WHEN TRAVELING! Click here for Parent and Player comments!